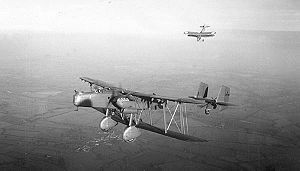 The Handley Page Heyford was a twin-engine British biplane bomber of the 1930s. Although it had a short service life, it equipped several squadrons of the RAF as one of the most important British bombers of the mid-1930s, and was the last biplane heavy bomber to serve with the RAF. The Heyford was built to Air Ministry specification B.19/27 for a heavy night bomber to replace the Vickers Virginia, competing with the Vickers Type 150 and the Fairey Hendon designs. 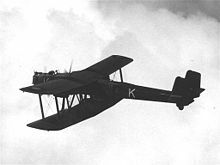 The prototype, the Handley Page HP.38, was designed by Handley Page's lead designer G R Volkert and first flew on 12 June 1930 at Handley Page's factory at Radlett, powered by two 525 hp (390 kW) Rolls-Royce Kestrel II engines driving two-blade propellers. The aircraft was of mixed construction having fabric-covered metal-frame wings, while the fuselage had an aluminium monocoque forward section with a fabric-covered frame to the rear, with open positions for the pilot and both the nose and dorsal gunners. The Heyford had a novel configuration, with the fuselage attached to the upper wing and the bomb bay in the thickened centre lower wing. This provided a good defensive field of fire for the nose and dorsal guns as well as the ventral retractable "dustbin" turret, each equipped with a single .303 in (7.7 mm) Lewis Gun. The fixed undercarriage consisted of large, spat-covered wheels. The design allowed ground crews to safely attach bombs while the engines were running, but the result was that the pilot was some 17 ft (5 m) off the ground. The HP.38 proved successful during service trials at Martlesham Heath and with No. 10 Squadron RAF and was chosen as the winner of the B19/27 competition, being ordered as the HP.50 Heyford. Production Heyford Is were fitted with 575 hp (429 kW) Kestrel III engines and retained the two-blade propellers, while the IAs had four-blade propellers. Engine variations marked the main Mk II and III differences; the former being equipped with 640 hp (480 kW) Kestrel IVs, supercharged to 695 hp (518 kW) in the Heyford III. The Heyford I entered service with No. 99 Squadron RAF, at RAF Upper Heyford in November 1933, and later with No. 10 Squadron and 7 Squadron, re-equipping with the Heyford IA and II in August 1934 and April 1935 respectively. As part of the RAF's Expansion scheme, orders were placed for 70 Heyford IIIs in 1936, with steam condenser-cooled Rolls-Royce Kestrel VI engines. The delivery of these aircraft allowed the RAF to have nine operational Heyford Squadrons by the end of 1936. These squadrons of Heyfords formed the major part of Bomber Command's night bomber strength in the late 1930s. Heyfords flew many long night exercises, sometimes flying mock attacks against targets in France. Disaster struck on one of these long-range exercises on 12 December 1936, when a flight of seven Heyfords of No. 102 Squadron RAF flying from Northern Ireland, encountered fog and icy weather conditions as they approached their base at RAF Finningley, Yorkshire. Four crashed and two had to make forced landings resulting in three crewmen killed and three injured. The Heyford started to be replaced in 1937, with the arrival in service of Armstrong Whitworth Whitleys and Vickers Wellesleys, finally being retired from frontline service in 1939. Some remained flying until 1940 as bombing and gunnery trainers, being declared obsolete in July 1939. At least two examples found experimental use; one for airborne radar and the other for inflight refuelling, and it is reported that one was still flying as late as 1944. Heyford I Powered by 575 hp (429 kW) Rolls-Royce Kestrel III engines: 15 built, serial numbers K3489-K3902 (last aircraft built as Mk.II prototype). Heyford IA Engine support changes, power-driven generator, four-blade propellers: 23 built, serial numbers K4021-K4043. Heyford II Powered by 640 hp (480 kW) Kestrel IV engines: 16 built, serial numbers K4863-K4878. Heyford III Supercharged 695 hp (518 kW) Kestrel VI engines: 70 built in two batches, serial numbers K5180-K5199 and K6857-K6906. No aircraft, or significant parts from one, survive. The Royal Air Force Museum has some Heyford components: a pair of main wheels, two blades of a Heyford propeller and tailplane parts of Heyford III, K6875 of 166 squadron, recovered from its crash site in the Peak District. Halley, James J. Royal Air Force Aircraft: K1000 to K9999. Tonbridge, Kent, UK: Air-Britain (Historians) Ltd., 1976. ISBN 0-85130-048-0. Moyes, Philip J.R. Bomber Squadrons of the RAF and their Aircraft. London: Macdonald and Jane's (Publishers) Ltd., 1964 ( new edition 1976). ISBN 0-354-01027-1. Moyes, Philip J.R. The Handley Page Heyford (Aircraft in Profile number 182). Leatherhead, Surrey, UK: Profile Publications Ltd., 1967. Handley Page Heyford Pictures and Handley Page Heyford for Sale.